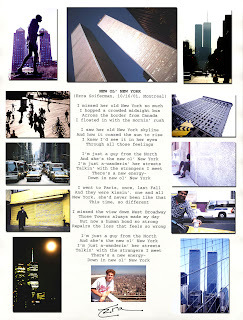 Ez Sez: From my Twin Towers files... "New ol' New York"
From my Twin Towers files... "New ol' New York"
I created this photo/poem montage not long after 9/11. When I lived in NYC (91-95) I used to take walks down to the Twin Towers and go to the observatory at the top to see the city from the perspective of a drop of water in the clouds. It was a great way to humble oneself. I also used to photograph the Twin Towers regularly, doing that had a bit of the opposite effect. So grand and photogenic were those buildings, one would think he or she was just maybe the very best photographer in the world. Alexandra and I are expecting a baby any day now. At a party recently someone said, "Yikes, I hope it's not born on September 11th!" Someone else cut in, "Actually, I think that would be the most beautiful thing. That day needs more souls." I leave you with that as I head out on a jog on this special day. Enjoy the poem and pix above.